Among our most common diseases, tooth decay can be a big problem at any age: in the U.S., one in four children 5 and under has some form of the disease, as well as ninety percent of those 60 and older — and a quarter of those have suffered complete tooth loss. 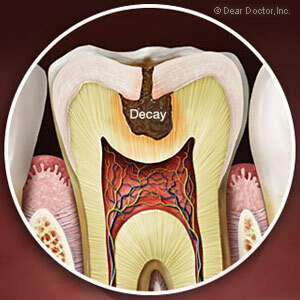 Fortunately, we now know what needs to be done on a regular basis to prevent tooth decay. Unfortunately, many are uninformed about all they need to do to lower their risk. Here, then, are 5 questions to ask yourself to see if you’re on the right prevention path or not. Do I brush and floss daily? If not, you’re aiding and abetting the “enemy” — bacteria that cause tooth decay. Bacteria that make up plaque feed on any food remnants that adhere to tooth surfaces. Brushing at least once daily (twice is better) removes plaque, while flossing removes plaque between teeth that can’t be reached with a brush. Removing plaque will lower your mouth’s acid levels that cause a loss of minerals to the enamel surface. Do I use the proper techniques for brushing and flossing? While it’s important to establish daily hygiene habits, if you’re not performing them properly you won’t realize the full benefit from your efforts. But don’t dismay — we can train you in the proper techniques for brushing and flossing your teeth. Do I use fluoride toothpaste? This naturally-occurring chemical strengthens tooth enamel and makes it more resistant to decay. You can increase fluoride’s absorption rate into enamel by using hygiene products that contain it. Do I constantly snack between meals? Saliva neutralizes acid remaining in the mouth after eating in about 30 to 60 minutes. If you’re constantly snacking or sipping acidic beverages, however, saliva can’t do this effectively. It’s best to limit snacking to a few, specific times and restrict acidic beverages to meal time only. Do I visit the dentist for cleanings and checkups? While brushing and flossing reduce plaque, it can’t remove it from hard-to-reach places below the gums or harder deposits (calculus) that have developed. A professional cleaning twice a year removes the plaque and calculus left from daily hygiene. We can also gauge the health of your teeth and determine if tooth decay or gum disease may be developing.